ISBN-13: 978-0952260370 ISBN-10: 0952260379 Edition: 3rd ed. 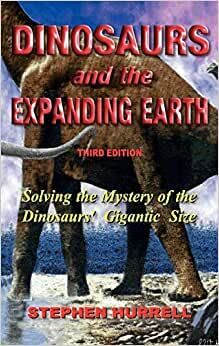 Start reading Dinosaurs and the Expanding Earth on your Kindle in under a minute. NOT kindle, I purchased a solid hardback book. Over 65 million years ago the Earth gravity was one third of today's. What produced this change in gravity? According to this and other publications on the subject the evidence leads to the fact our planet and most probably all celestial objects have slowly undergo a natural process of growth and expansion. This, the only logical theory of the extinction of the dinosaurs, is based on the idea that the growth of the hollow orb along million of years increased the size of the seas and gravity and as a result the dinosaurs' weight and their difficulty of movement. That a heavier and larger planet slowly restricted their possibilities to survive and evidently all life, including most flora and fauna and even insects, to adjust to a stronger gravitational force, gradually along eons became smaller and lighter. This is a well-researched, thrice revised, profusely illustrated, a logical and sensible theoretical postulation by an engineer who knows the exact meaning of the ratio between gravity versus size, mass, volume and weight. This book gives excellent evidence for an expanding earth. The scale of dinosaurs over time predicts an exponential growth of the earth and independently the geology of the earth makes the same prediction. Its hard to ignore the evidence and this book does an excellent job explaining it. I do feel though, that the hypothesis given in this book trying to explain how the earth expands is pretty weak which is why I give it a 4 star rating instead of a 5 star. I would recommend this book to anybody who isn't familiar with the expanding earth theory. It explains the history of this theory and gives convincing evidence that the earth is indeed expanding. 5.0 out of 5 starsThe earth is growing! This theory makes perfect sense and I am very happy I read this book. I have no problem with this view of geologic history, but a lot of people think I'm retarded for taking it seriously. Someday the world will be gigantic and their descendants will be neotonic hyper-cephalic humanoids one foot tall whether they believe it or not! 5.0 out of 5 starsWe need challengers like this! Thanks, Stephen Hurrell for a new angle of approach! The conventional theories always seem to have large holes that everyone is happy to excuse simply because the "train inertia" that has built up is so large (grants, conflicts of interest, etc.). But we need new views like this to challenge the absurdity of existing theory "large holes". Stephen Hurrell has written a landmark book that will still be read and cited 100 years from now. Although others before Hurrell had postulated that dinosaurs evolved in reduced surface gravity, i.e. less than it is today, Hurrell's book is the first to fully develop the argument. Hurrell is an engineer by profession, and he applies the principles of engineering to the problem of dinosaur giantism and shows how and why dinosaurs must have evolved in reduced gravity. Amazingly, many paleontologists, including Robert Bakker, deny that dinosaurs were exceptionally large, and they point to the large mammals that lived during the Miocene and Pleistocene as proof. But the mass of the largest land mammals was merely tens-of-tons. The largest dinosaurs were over 100 tons, as massive as a Blue Whale. According to Bakker, the AVERAGE mass of the Late Jurassic herbivores (mainly sauropods and stegosaurs) was 20 tons! And in the current fauna, body mass at the generic level is at least an order of magnitude less than dinosaurs. According to the late Nicholas Hotton, who DID believe that dinosaurs were exceptionally large and unique in tetrapod history, the smallest dinosaur was bigger than two-thirds of all living mammals; the majority of dinosaurs were bigger than all but 2% of living mammals. So, if you want to impress your friends AND stay ahead of the curve, buy TWO copies of Hurrell's book, one for yourself, and one for a friend.